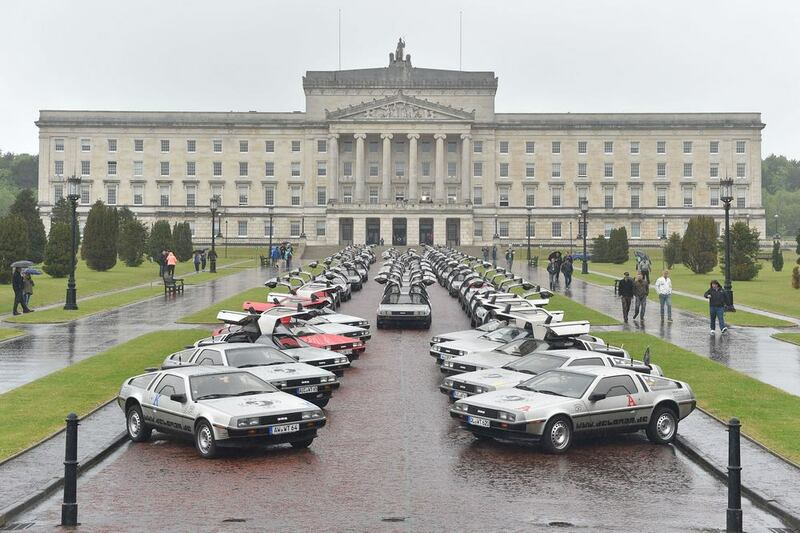 A convoy of over 70 De Lorean’s line up at Stormont to take part in an iconic photograph in front of the Assembly Parliament Building. The event was part of the De Lorean Owners Association’s Eurofest. Over 250 DeLorean owners and enthusiasts from 18 countries are in Belfast this week to celebrate the 35th Anniversary of the world famous stainless steel gull-winged marque. The DeLorean Eurofest event which is the biggest ever to be organised by the international DeLorean Owners’ Association is based at the Europa Hotel but events will take place in venues across the City from Thursday 26th May until Sunday 29th May). Owners and enthusiasts taking part include visitors from Australia, the USA Austria, Belgium, France, Germany, Hungary, Italy, Latvia, Netherlands, Northern Ireland, Norway, Slovakia, Sweden, Switzerland as well as from the rest of the UK and Ireland. Around 80 DeLorean cars are expected in the City with many arriving by ferry, some driven from as far away as Hungary. One of the highlights of the packed programme will be the arrival in Belfast on Thursday morning of three DeLorean drivers who set off from Germany eight months ago to circle the globe in their cars. After 23,500 miles and many adventures – including having the cars impounded by quarantine officials in Australia – the three will reach their final destination, the home of the DeLorean. On Thursday afternoon the three DeLorean globe-trotters will join a further 65 DeLorean drivers and their cars to travel by convoy from the Europa Hotel to Parliament Buildings, Stormont for a photo-opportunity along the iconic Prince of Wales Avenue. The group will then travel on to the Ulster Folk and Transport Museum, Cultra. Friday sees a series of private events including a visit to the site of the former DeLorean factory and test track which is now owned by car components firm Montupet. However the public will have the opportunity to view all the cars and meet the drivers taking part when the cavalcade travels to the Titanic Centre on Saturday afternoon. “Our ability to attract so many DeLorean owners to make the journey to Belfast for this event is testament to the high regard in which this City and the people who created this wonderful sports car are held. We have owners driving their cars from as far away as Hungary all so that they can say they celebrated the 35th Anniversary of the first DeLorean rolling off the production line, in Belfast. Over the course of the event the owners and enthusiasts will have a unique opportunity to immerse themselves in all things DeLorean including meeting with some of the people who worked in the Dunmurry factory. All these years later, they too still have a deep affection for this beautiful car and the dream it promised”.